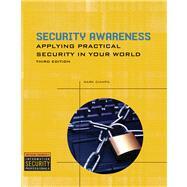 Security Awareness is a successful, brief, non-technical introduction to computer security. With computer security concerns reaching into so many aspects of our daily lives, everyone who owns a home computer is at risk. This book covers all of the need-to-know information about staying secure including maintaining a secure environment and how to avoid security attacks. The book also compliments other Information Technology areas such as networking and certifications including CompTIA's Network+ and Security+ exams.